TGIF! 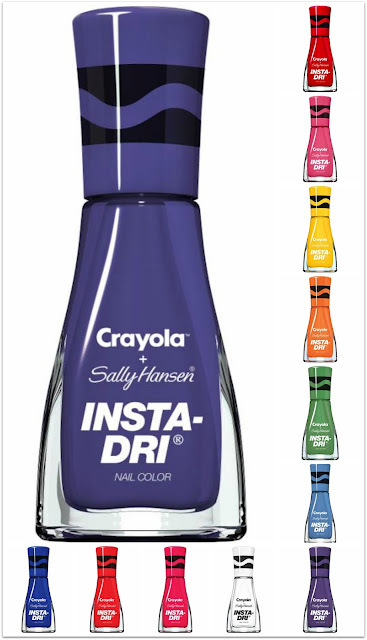 Have you heard of the new collaboration between Sally Hansen and Crayola? I, for one, am super excited to get my hands on these! I think they were released this week, but haven't been anywhere to confirm that. I dunno, I think I want all of them! I've also heard that these will stamp, so if you are into nail art, you may want to pick these up. They'll likely retail for ~$3.99-$4.99 depending on where you get them. Will you be picking any of these up? Sharpen those pencils, pack that apple, and add the final touch to your back-to-school look in an instant! The new Sally Hansen + Crayola Insta-Dri Collection transports you back to that care-free time of coloring with crayons, sketching out vibrant creations, and jumping back into the September back to school season. Color authorities Crayola and Sally Hansen joined forces to offer a bright, bold, and fun suite of hues that dry in just 60 seconds — so no time is wasted for the woman on the go. With a 60 second dry time, Sally Hansen Insta-Dri® Nail Color’s 3-in-1 formula features a built-in base and top coat to provide shiny, extended wear in a single step in just one stroke. These color specialists did their homework: From a saturated red to a marvelously mod white, here are the 12 new, specially designed shades inspired directly by the Crayola crayon colors we all know and love. Ripe and ravishing, this primary red crème shade is a classic. As bold as it is beautiful, this hue conjures memories of blissful beachy evenings. Everything’s coming up carnations in this vivid, pretty pink. Picked right from a sprawling field, this sunny saturated yellow is a force of nature. Take it to the tart side in this vivaciously verdant polish. Rock this hue, it’s a go-to blue for back to school. Cultivate the feeling of floral fancy in this purple shade that elevates any first-day-of-school outfit. No better way to kick off the year than with a blank slate. Be crisper than a white board with this pristine white. It’s your time to shine bright and be a dazzling star with this raspberry hue. Show off your summer tan with this red hot mani. Casually cool, this jean-ius indigo hue goes with everything. Be the Queen Bee in this courageously colorful purple. Sally Hansen’s Insta-Dri® is #1 in the quick-dry segment. The Sally Hansen X Crayola Insta-Dri Back To School Collection will be available July 2017. Crayola is the worldwide leader in children’s creative expression products. The Crayola brand is known for its iconic Crayola crayons, and portfolio of colorful and innovative art tools, crafting activities and creative toys.